With his hands. Pallas Athena loved him especially. And on him especially, since he understood nothing of the divine prophecies. Went straight through his bladder under the bone. He fell to his knee and groaned. Then death overtook him. οἷ τ’ αὐτῷ, ἐπεὶ οὔ τι θεῶν ἐκ θέσφατα ᾔδη. γνὺξ δ’ ἔριπ’ οἰμώξας, θάνατος δέ μιν ἀμφεκάλυψε. Whole Schol. bT ad Il.5.59 glosses the name Phereklos as “one who brings the turmoil of war through the ships” (Φέρεκλος ὁ φέρων κλόνον διὰ τῶν νέων), I would also like to believe that name Phere-klos, might make someone think of ‘fame-bringer’. And the connection between poetic fame and the activity of the war arises elsewhere in this passage two. Note that the this Phere-klos is the son of Harmonidês, a man who, according to the passage, is the one who build the ships “the bringers of evil” (ἀρχεκάκους) for Paris (those ships which carried him from Troy to Sparta…). The name Harmonidês is not insignificant: Gregory Nagy has etymologized Homer as “one who fits the song together”. Phereklos’ father is a “craftsman” (“tektôn”) who built the very ships that allowed his son (and Paris) to bring the conflict to Troy and generate the fame of the songs it generated. Here, the ships are positioned as the first steps in evil, but I would suggest, that as the means by which the songs themselves travel across the sea, the ships are, as products of specialized craftsmen, both metonymns for the stories themselves and necessary vehicles for their transmission. If this is not too blinkered or mad a suggestion, perhaps Phereklos’ death here is a reassertion of the poetic power of song over the pragmatic craft of shipwrights…. 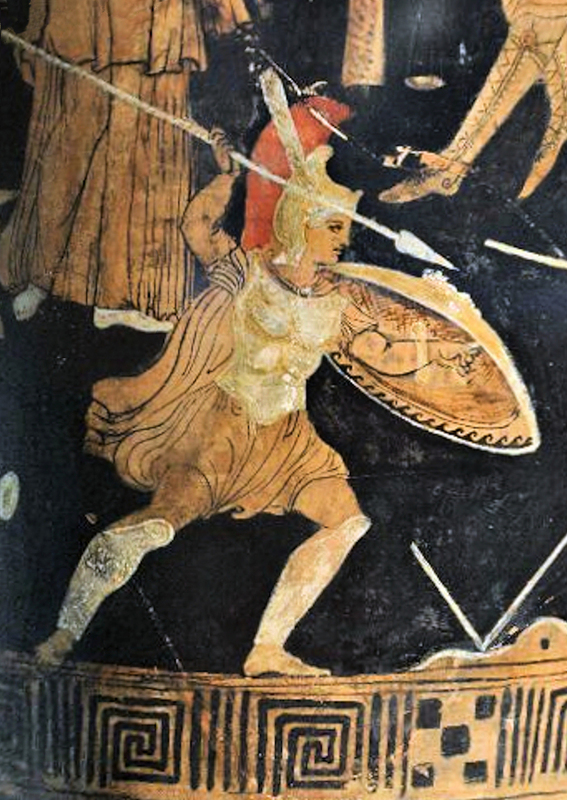 Why Does the Iliad Begin with Rage? “Sing the rage..” [People] ask why the poem begins from rage, so ill-famed a word. It does for two reasons. First, so that it might [grab the attention] of that particular portion of the soul and make audiences more ready for the sublime and position us to handle sufferings nobly, since it is about to narrate wars. Menis, “rage” is a big deal in Greek epic and myth thematically. The ancient scholiasts may not have it all figured out. But my first Greek teacher, Lenny Muellner, has some pretty good ideas on this one. Patroklos converses thoughtfully and with understanding. This line, then, is inserted from the Odyssey [where it does not exist]. For there [Homer] makes the psykhai into shadowy ghosts with no share of understanding. μὴν οἱ ἄταφοι προμαντεύονται. T ἢ εἰσὶ μέν, οὐ μὴν πάμπαν. “The rest of them were sitting, and they had taken their seats. –whatever he thought would be amusing to the Argives. And he was the most shameful man who came to Troy. His head was mishapen, and the hair on his head was sparse. Were terribly angry at him and were finding fault in their heart. See here for a handout for a talk using Thersites to explore Homeric poetry from the perspective of disability studies. ex. αἴσχιστος: τοῦτο καὶ ἐπὶ πιθήκου. Homer presents a overlap between ‘beautiful body’ and ‘beautiful mind’. This physiognomic category error pervades a great deal of classical Greek culture. In the Iliad, Thersites transgresses physical boundaries through his unheroic body and ethical boundaries by using the genre of rebuke upward in the social hierarchy. He is hateful to both Achilles and Odysseus because they exemplify in a complementary fashion the ‘center’ or ideal of the heroic person—Achilles is the beautiful body, Odysseus is a beautiful mind. But both of them stay within the boundaries of ‘normal’ in their own deviance (Achilles’ political straying, Odysseus’ aging, imperfect body). Thersites, labelled by many as a comic scapegoat, functions as an inferior in order to define the center as non-transgressive. This is, in particular, why he is hateful to Achilles and Odysseus: without him, their persons might be monstrous or disabled. And this also helps explain why Odysseus must physical beat Thersites in public. Thomson, Rosemarie Garland. 1997. Extraordinary Bodies: Figuring Physical Disability in American Culture and Literature. New York. Mitchell, David T. and Sharon L. Snyder. Narrative Prosthesis: Disability and the Dependency of Discourse. Ann Arbor. 2000. Cf. Wills, David. 1995. Prosthesis. Stanford. See Odyssey: 1.302: “I see that you are really big and noble, and be brave / that a man born in the future might speak well of you” μάλα γάρ σ’ ὁρόω καλόν τε μέγαν τε, / ἄλκιμος ἔσσ’, ἵνα τίς σε καὶ ὀψιγόνων ἐὺ εἴπῃ =3.199–200 (Nestor addressing Telemachus). Cf. 4.141–147 where Helen recognizes Telemachus because he looks like his father and Menelaos responds “I was just now thinking this too, wife, as you note the similarity: / these are the kinds of feet and hands / the eye glances, and head and hair belonging to that man” (οὕτω νῦν καὶ ἐγὼ νοέω, γύναι, ὡς σὺ ἐΐσκεις· / κείνου γὰρ τοιοίδε πόδες τοιαίδε τε χεῖρες / ὀφθαλμῶν τε βολαὶ κεφαλή τ’ ἐφύπερθέ τε χαῖται, 4.148–150). 167–8: Rebuke is a speech genre highly marked for social position: Penelope rebukes Eurykleia, Nausikaa rebukes her handmaidens. Melanthô should not rebuke Odysseus because it would transgress the normative boundaries for a slave to reproach a master. On Thersites as a “bona fide satirist”, see Rosen 2003:123. Halliwell 1991:281 too draws attention to Thersites’ role as a “habitual entertainer”, and points to Plato’s shrewd description of him as a γελωτοποιός (Rep.10.620c3). For Thersites as a blame-poet, see Nagy 1979: 211-75. For Thersites’ in general see Lowry 1991 and Postelthwaite 1998. Lowry, E. R. Thersites: A Study in Comic Shame. Marks, Jim. 2005. “The Ongoing Neikos: Thersites, Odysseus, and Achilleus.” AJP 126:1–31. Nagy, G. 1979. The Best of the Achaeans. Baltimore. Postlethwaite, N. 1998.Thersites in the Iliad, in Homer: Greek and Roman Studies, eds. I. McAuslan and P. Walcot, Oxford, = 83-95. Rose, P. W. 1997. “Ideology in the Iliad: Polis, Basileus, Theoi.” Arethusa 30:151-199. Rosen, R. M. 2003. “The Death of Thersites and the Sympotic Performance of Iambic Mock-ery.” Pallas 61:21–136. Thalmann, W. G. 1988. “Thersites: comedy, scapegoats and heroic ideology in the Iliad.” TAPA 118:1-28. Vodoklys, E.1992.. Blame-Expression in the Epic Tradition. New York. Special thanks to David M. Perry for giving me a starter Bibliography for Disability Studies and to Dimitri Nakassis for adding to the bibliography on Thersites. And anoint him with ambrosia and put ambrosial clothes around him. Place him in the rich land of wide Lykia. τύμβῳ τε στήλῃ τε· τὸ γὰρ γέρας ἐστὶ θανόντων. ῝Ως ἔφατ’, οὐδ’ ἄρα πατρὸς ἀνηκούστησεν ᾿Απόλλων. His head was mishaped, and the hair on his head was sparse.